We were staying at Greshornish House, about a 20-minute drive from Portree, and dusk was falling as we reached the final leg of our journey on a windy, single-track road. The very friendly manager Alan, who treated us so well over our whole weekend, showed us to our room on the top floor. The room had a lovely modern decor and was very spacious. Fully equipped with flat-screen television, a huge en suite and tea/coffee and homemade shortbread, we had everything we needed. Ready for dinner, we were seated in the inviting dining room that twinkled with fairy lights. The menu had four choices of starters, mains and desserts as well a few daily specials. We went straight to mains and I devoured my pan roasted chicken supreme. The chicken was cooked perfectly while the delicious accompaniments, salt baked mash, parma ham and brie, gave the dish a real balance of flavours. My husband chose one of the specials, locally caught seabass. There was plenty of fish with a tasty crisp skin, all towered on top of sunblushed salsa and asparagus and finished off with a potato rosti. Never one to skip dessert, I was in chocolate heaven with my double chocolate tart with strawberry ice cream, while across the table, the lemon tart looked divine and had just the right amount of tangy lemon flavouring. Afterwards, we relaxed in the hotel’s lounge which had sumptuous couches and a roaring log fire. As we woke the next morning, we could see the gorgeous view from our bed right across the Greshornish peninsula to the cliffs beyond. We enjoyed a hearty breakfast which included traditional Scottish delights of haggis and tattie scones, a must-have in my husband’s opinion. The weather wasn’t the greatest, but this is Scotland and we were determined to carry on with our plans regardless. We climbed up to the The Old Man of Storr which, despite the weather, was very busy. The walk was fairly easy and the views were well worth it over the rugged coastline towards the islands of Raasay and Rona, while the rolling mist added a little drama to the landscape. 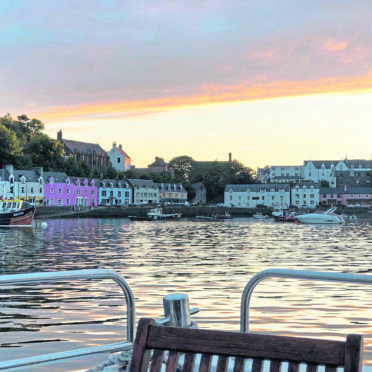 Our afternoon activity was a trip on the Seaflower, a luxury catamaran departing from Portree harbour. Our hosts Ewan and Janice welcomed us aboard. 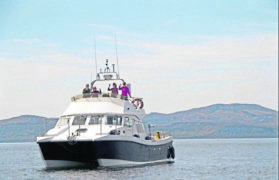 The Seaflower, a luxury catamaran which runs trips out of Portree harbour. 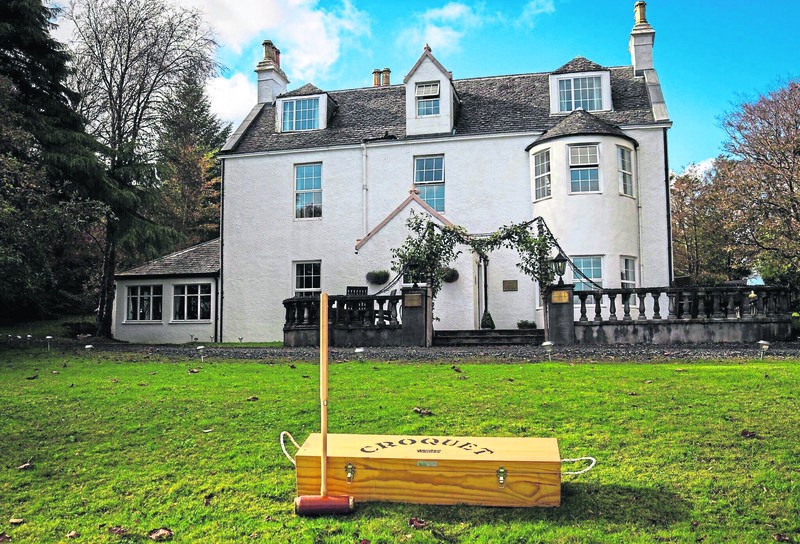 Their website states “whether it is hiking, history, whisky tasting or simply relaxing, we have a tour to offer”. We were booked on a seafood cruise and, as it was raining, we sat inside the cosy cabin, which was surprisingly spacious. We quickly left behind the small harbour and the quaint coloured houses on the quay heading to Rona, a small island with only a couple of holiday cottages to let and a caretaking couple who reside there all year round. I couldn’t imagine living anywhere so remote where the only way out and in is by boat, although I am assured it has great Wi-Fi! Luckily for us, Ewan spotted some dolphins and we rushed out with binoculars to see hundreds of them swimming to greet us. There must have been about 200 of them jumping and frolicking around, and underneath the boat catching the surf. 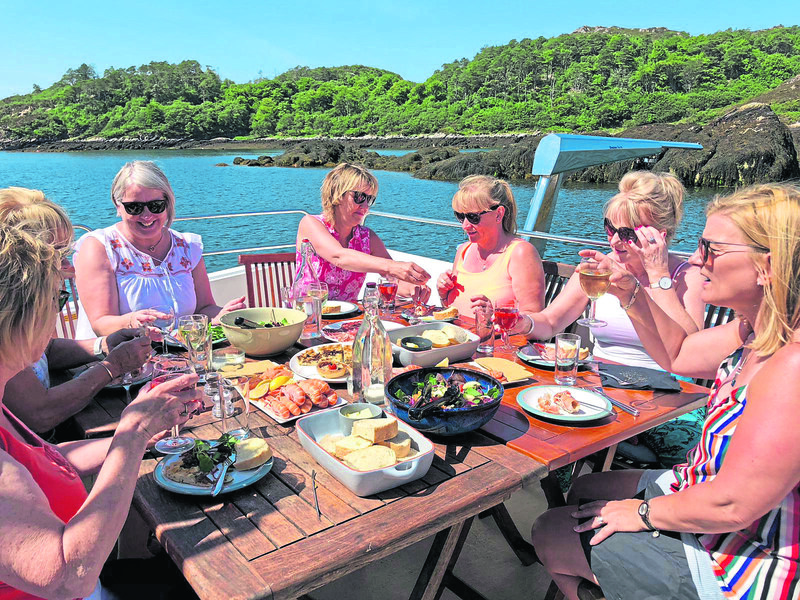 On arrival at the tiny harbour of Rona, our seafood feast was being prepared and we enjoyed a lunch of Cullen skink, huge langoustines, smoked salmon, squat lobster, crusty breads and salads, washed down with crisp white wine. 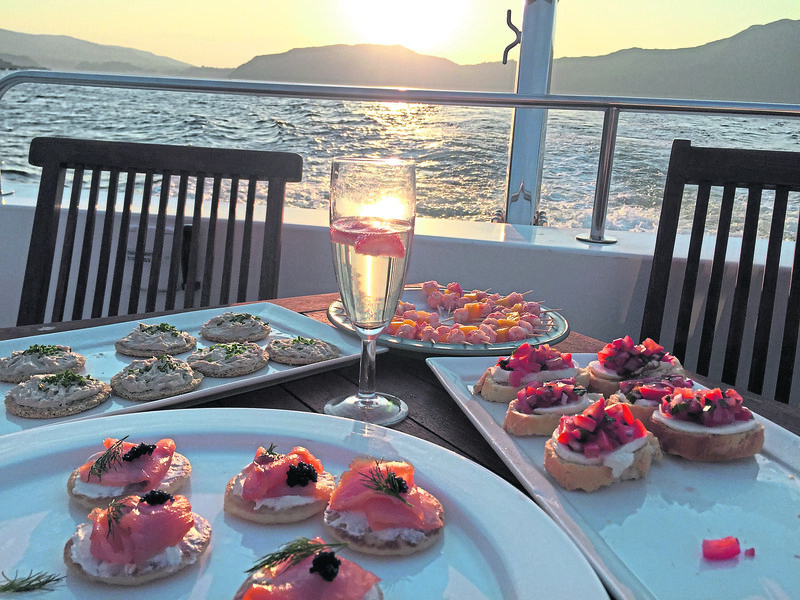 The seafood is all caught locally by Ewan’s father and they often pass his boat while out on the cruises. Seals basked on rocks nearby and we managed a hike around the island where we spotted a magnificent stag up on the hill and were treated to some fabulous views despite the rain. We returned to the harbour late afternoon shattered after our fabulous afternoon at sea. The next day we squeezed in a visit to the Fairy Pools before returning home. It takes about 45 minutes to get there on foot, but it’s a fairly easy walk, although there’s a bit of balancing on stepping stones to cross the streams. The walk is shadowed by the Cuillin mountains and takes you to some stunning waterfalls running into beautiful crystal-clear blue and green pools. Two days in Skye is not long enough and we have already booked up to go back next year. If you are intending on visiting, we recommend a trip on the Seaflower. With local knowledge, excellent food, stunning scenery and maybe even a dolphin display, it’s a day out that you will never forget.